Bleak's House is the boss level of K3, the fifth world of Donkey Kong Country 3: Dixie Kong's Double Trouble! It consists of a snowball fight against Bleak, using the same gameplay style as Swanky's Sideshow. This level's name is a pun on the Charles Dickens novel Bleak House. The objective of the fight is to hit the glowing red spot on Bleak's tie with snowballs while dodging Bleak's own snowballs. Bleak will repeatedly rise up from behind the piles of snow in random locations, throwing four snowballs each time. He can appear at two different distances from the Kongs, and the player can press up and down on the to alter the Kongs' throwing distance accordingly. Once Bleak takes a hit, he will speed up slightly and start throwing eight snowballs before appearing in another spot. After the second hit, Bleak changes tactics. He will now start launching giant snowballs out of his hat in a pattern, starting off aiming toward one side and progressing to the other and back again. Eventually, he will start laughing and expose his weak point. If the Kongs manage to hit him, he will repeat the same attack, only faster, and at the end, he will launch multiple snowballs at a time. After the fourth hit, Bleak resumes his original attack pattern, this time much faster than before and only throwing two snowballs each time he appears. He continues to do this until he gets hit again, after which he will start launching snowballs out of his hat at a rapid pace, concluding by firing seven volleys of simultaneous snowballs. One more hit will cause Bleak to explode, making him drop a Bonus Coin in the process. 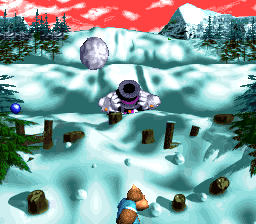 In the Game Boy Advance version, it is no longer necessary to use the to determine the throwing distance of the Kongs' snowballs. Instead, the active Kong will automatically target whichever layer Bleak is on. Bleak no longer speeds up as he takes damage during the phases where he throws snowballs, and he always throws four snowballs before appearing in another location regardless of how much damage he has taken. When Bleak is launching multiple snowballs out of his hat at once, the intervals between each volley are shorter, giving the Kongs less time to react to them. During Bleak's final attack, he will only shoot six volleys of snowballs out of his hat instead of seven. In the SNES version, returning to this stage after completing it and defeating Bleak again rewards the Kongs with a Bear Coin, as is the case for all boss stages. However, in the Game Boy Advance version, there is no reward for rematching Bleak. Instead, the game simply shows the animation for obtaining the Bonus Coin again without increasing the Bonus Coin counter. This is unusual, since the other bosses in the GBA version still give out Bear Coins when rematched. This page was last edited on January 22, 2019, at 23:57.